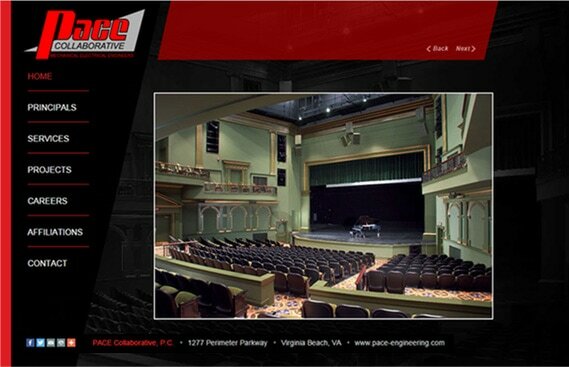 Website design Structural Engineering Firms| PACE Collaborative, P.C. wanted to have a creative website design. We utilized the angular shape of their branded logo design. These unique angles are throughout the pages of the over the website redesign process. The result is a powerful look with black and white photos juxtaposition to color photos engineering projects. There are unique interior website pages using interior scroll bars and thoughtful application of text content and photography. The result was a bold and powerful website that captures a visitors attention the moment the home page loads. Search ‘Website design Structural Engineering Firms’ find VISIONEFX. Let us provide your next web design for your engineering firm. VISIONEFX is a Virginia Web design company. We provide custom design, ecommerce, SEO and Website maintenance services. Call: (757) 619-6456 or email info@visionefx.net.